Apparently I’m not yet over the concept of breakfast week. 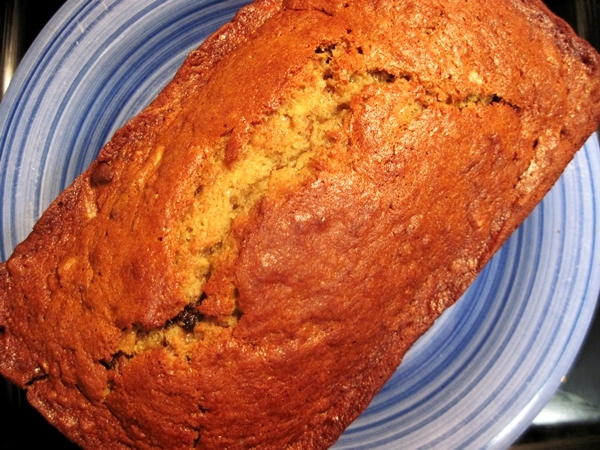 Or, more accurately, the bananas that ripened all too quickly in my pantry wanted in on the early-morning action. Speaking of action, this blog has been seeing a lot of it recently. If you’re new here, or even if you’re an old friend, I’d love for you to leave a comment and tell me about yourself–why you’re here, what you like to eat, whether you live in the Triangle and want to be Real Life friends… let me know! Recipe adapted from Martha Stewart’s. I added chocolate chips because there was no reason not to. 1) Preheat oven to 350 degrees. Butter a 9–inch loaf pan and set aside. Cream butter and sugar in a large bowl for several minutes, until fluffy. Add eggs and beat to combine. 2) In another bowl, whisk together flour, baking soda, and salt. Add to the butter mixture, and mix until just combined. Add bananas, buttermilk, and vanilla. Stir in nuts (and chocolate chips, if you want) and pour into prepared pan. 3) Bake until a toothpick inserted into the center of bread cake comes out clean, about 1 hour and 10 minutes. Let rest in pan for 10 minutes, then place on a rack to cool. 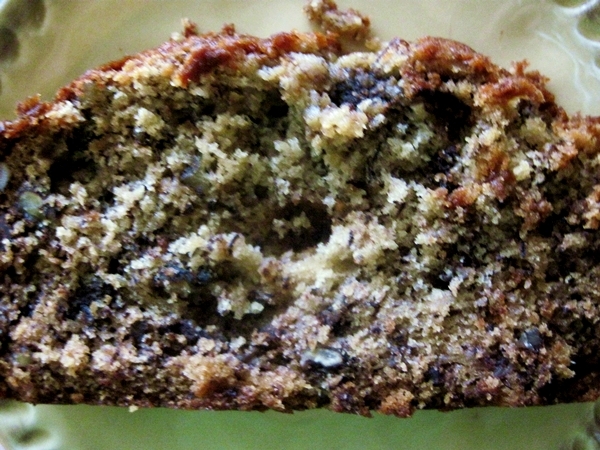 This entry was posted in bread, breakfast and tagged banana, buttermilk, chocolate chips, pecans. Bookmark the permalink. I like to eat whatever you make. I also see that I have had some influences on your food choices. The past 16 years of my life have been spent in Cary, NC. I will be your Real Friend, supporter, promoter, sounding board, fellow foodie, and anything else you may need… because I am your momma. Thanks so much for your comment, Casey! Let me know how the bread turns out. I’d love to meet some time–you could come to one of our Tuesday dinners!